The band's first rehearsal was held in May 2003 under the direction of Mr. Greg Mason and their first public performance followed on August 14, 2003 in Shepard Park. In September 2003, the marching unit participated in the centennial celebration of the Village of Lake George. Since then the LGCB has become a family to its members and an asset to its community. Its audience continues to grow. Concert attendance in the park increased from 100 to 400+. In 2005 we hosted our first Community Band Festival which was a showcase of nine bands from surrounding states and a tribute to our faithful audience. This festival was continued each year since and is being repeated in 2019. For details click on the Festival button at the side of the page. In addition, the band has spring and winter concerts at the Glens Falls Jr./Sr. High School and the Lake George High School. Mr. Raymond Durkee served as Music Director for 2010 and 2011. Dr. Jay Hilfiger served as our temporary Music Director throughout most of 2012 and into 2013. In May of 2013 the band was pleased to announce the appointment of Mr. MIchael Craner as its Music Director. With the excellent support we receive from the Village of Lake George, the Town of Lake George, the Lake George Fire Department. the Lake George High School, Warren County, the Wood Foundation and the Lower Adirondack Regional Arts Council, the Lake George Community Band will continue to be an integral part of the community. 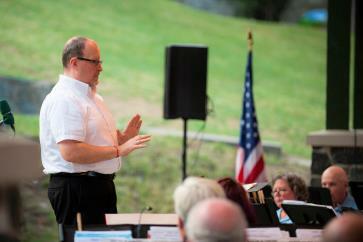 Director Mike Craner conducts a concert in Shepard Park, Lake George.